The Enochian keys or calls were delivered to Dee and Kelly in Enochian. This is an entirely different language then English, and is made up of characters that are different from the Latin letters, or letters of the English language. Some scholars have made claims that the Enochian letters are older than any written language including Sanskrit. Some see resemblances between these Enochian letters and Sanskrit, thinking that the Enochian letters are what Sanskrit is based from. Aside from speculation about lost writings of old, the Enochian letters did not appear until they were given to Dee and Kelly by the angels. 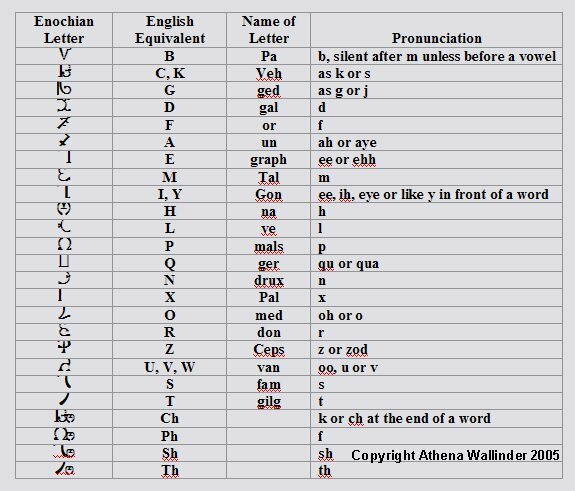 Below is a table containing the 21 letters of the Enochian alphabet, along with their pronunciation according to the Enochian angels. The Enochian letters are magickal symbols that each contain an angelic force. The student should learn how to draw and paint them proficiently. Their correspondences and how they look should also be memorized. One example use for this is when you are skrying and one of the angels wishes to impart something with Enochian letters. Also, the drawing and getting to know the Enochian letters will bring one closer to the powers behind this magickal language. The letters are the basis and foundation of any language, so to have a good connection and understanding of the Enochian language, one must have an understanding of the alphabet. Enochian words are written from left to right just as in English. There were not any correspondences given with the Enochian letters. As the magickal world appears to be based on correspondences we can speculate what sort of correspondences would work with these letters. Some people simply use the correspondences that Crowley and others have attributed to the 22 letters of the Hebrew alphabet, and have found this to work quite well. Many practitioners also use the numerological correspondences of the Hebrew alphabet as a system of Enochian numerology. Sine there are 21 letters one could attribute them to the 7 planets (metals), and the three alchemical principals of nature. 7X3. Much of the Enochian system is broken down into numbers that are divisible by 7. With this division, one could look at it as the 7 planetary divisions of salt, the physical body and crystallization, sulpher the soul and the purification, and mercury the spirit and enlightenment. I have used all Enochian letters instead of English letters on all of my Enochian tools, including the tablets, the sigil dei Aemeth, and any elemental tools I have found that the Enochian letters have much more power and magick about them. Also, since the system I am working with is Enochian, it makes more sense to me for everything to be written in the Enochian letters.. For example, the GD tools are made with the original Hebrew letters instead of English because of the inherent power within the alphabet; this is the same case with Enochian in my opinion. One debate for this is that one cannot read the Enochian letters as easily. Many people cannot easily read the Hebrew letters on their GD tools either. Also, once you have constructed a complete set of Enochian tablets, you will have the letters memorized extremely well. Another argument is that the letters for the great table were given in Latin letters not Enochian. However the reason for this is that in previous skrying sessions the angels told Dee and Kelly to memorize the Enochian alphabet as this would make it easier to deliver the system. Some people have added an extra letter to the Enochian alphabet. This letter was obtained by a student of Pat Zelowski and in included in book on Golden Dawn Enochian magick. This changes the number of Enochian letters from 21 to 22, which corresponds quite nicely with the Hebrew alphabet. The name of the 22nd letter is: and it looks like this: Some practitioners have found success by including this extra letter, while others have not. Personally I tend to stick with the original information presented in the diaries until I know it inside out, then I will explore further. The pronunciation of the Enochian letters and words is one of the major issues of debate within the Enochian system. The main reason for this is the fact that most of the Enochian words are nearly unpronounceable compared to what we are used to. It can be quite difficult to say or vibrate words with more than two consonants in a row. The original pronunciation systems follows the rule of pronouncing each words as each letter would sound; there are a few acceptions to this which include: z is sometimes pronouced zod but not in many cases; i is pronounced as ee; In “A True and Faithful...” there are several pronunciation guides for many of the Enochian words as the Enochian calls were given. Also, throughout the diaries, the angels give pronunciations for many of the angel names on the great table as well as within the heptarchy. The Golden Dawn has found a way around the multiple consonant problem, they simply add another vowel sound after most of the consonants. For example P = Pey, H = Hey, B = Bah, C = Coh, D = Doh, G = Ga, T = Teh etc. The method that the GD uses to ascertain which vowel they will use is by using the Hebrew alphabet. The GD takes the next vowel in the name of the Hebrew letter, after the letter in question. For example if the letter T is used, the vowel would be A. Wescott also instructed the student to take each letter seperatly when pronouncing a word. For example MPH would be eM Peh Heh as opposed to MPH. The Arum Solis has come up with their own pronunciation system; most of the Enochian names follow the GD pronunciation pattern, however there are a few names which differ in this rule. The AS lists every Enochian name and word and their pronunciation for it. For more information see the Mysteria Magica by Denning and Phillips. As there does not seem to be an exact method for how they pronounce the names (perhaps they asked the angels on each one), it is easier to just look them up in their book. Luckily a new edition of the much sought after book three has been re-released. A system of talismatic magick has also been suggested using the Enochian letters. Talismatic magick (as to not confuse it with talismanic magick) is a method where each letter of the name of any particular entity corresponds to a certain characteristic. For example, if the entity had a four lettered name the first letter would equate with the description of the head and face, the second letter with the torso etc. This system was written about by the GD originally using Hebrew letters and Kabbalistic angels. Unfortunately much of the work that has been done with talismatic magick with Enochian simply correlates the Enochian letters with that of the the Hebrew letters. No one has come up with a talismatic system for the Enochian letters, accept for perhaps using Patricia Shaeffer’s letter essences outlined above. The Hebrew talismatic magick correspondences are usually used. It would be interesting for someone to come up with a talismatic system with the Enochian letters. Patricia has come up with the closest version of this through her skrying. However her system deals more with the nature of the letters than of a physical characteristic of an entity. Enochian as a pseudo language can be learned quite easily. This may sound impossible, however most university courses require more memorization in one semester! There are approximately 500 Enochian words that are contained within the original diaries (that I have found in the Enochian dictionaries). This number does not include the names of the various Enochian entities, nor does it include the Enochian words later added by the GD and/or Crowley. I recommend flash cards if one wishes to memorize the Enochian words.